Mississauga mortgage rates are highly competitive due to steep housing prices and proximity to Canada’s largest city. The following are the lowest rates from providers with offices within the Mississauga region. For providers across the province, reference the best rates in Ontario. City in Brief: Mississauga lies on the shores of Lake Ontario directly west of Toronto and is currently the sixth largest city in Canada. 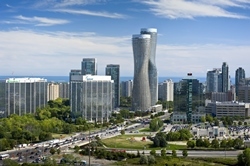 Mississauga is home to Toronto Pearson International Airport and numerous major corporate headquarters. Several large malls in the city also make it a popular shopping destination.